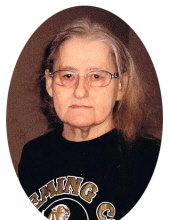 Allene Boone Perry, age 73, of Morehead Road, Wallingford, passed away Thursday, February 21, 2019, at St. Claire HealthCare in Morehead. Born October 8, 1945, in Mason County, she was the daughter of the late John Ronald Boone and Ethel Louise Merrill. In addition to her parents, she was preceded in death by a daughter, Mary Ann Perry; a son, David Kennard Perry, and a son-in-law, Tracy Howard. Allene is survived by her husband of 53 years, Burl Kennard Perry, whom she married February 22, 1966; five daughters, Barbara White (Phillip) of Hillsboro, Linda Easton (Danny) of Morehead, Brenda Royse (Pat) of Wallingford, Elaine Morgan (Tim) of Hillsboro, and Tammy Howard of West Liberty; one brother, Pete Roy Boone (Marie) of Owingsville; one sister, Angie Kay Cord (Randy) of May’s Lick; 15 grandchildren; and five great grandchildren. She was a homemaker and was a member of the Crain Creek Christian Church. Allene enjoyed watching soap operas and wrestling, listening to gospel music, and especially spending time with her grandchildren. Funeral services will be conducted 1 p.m. Saturday, February 23, 2019, at Northcutt & Son Home for Funerals Memorial Chapel with Brother Scott Cummins and the Rev. Darry Cooper officiating. Burial will follow in Newman Cemetery in Fleming County. Pallbearers: Chris Easton, Kenneth White, Z J White, Bradley Howard, Samuel Morgan, and Josiah Morgan. Visitation will be from 6 p.m. to 8 p.m. Friday, February 22, 2019, at Northcutt & Son Home for Funerals in Morehead. To send flowers or a remembrance gift to the family of Allene Boone Perry, please visit our Tribute Store. "Email Address" would like to share the life celebration of Allene Boone Perry. Click on the "link" to go to share a favorite memory or leave a condolence message for the family.